Suha: One day, things will be better. Taxi Driver: Sounds like you’re not from here. ‘Paradise Now’ is not exactly the newest of movies, but I must admit to knowing little of this movie other than the controversy that it created a few years back. 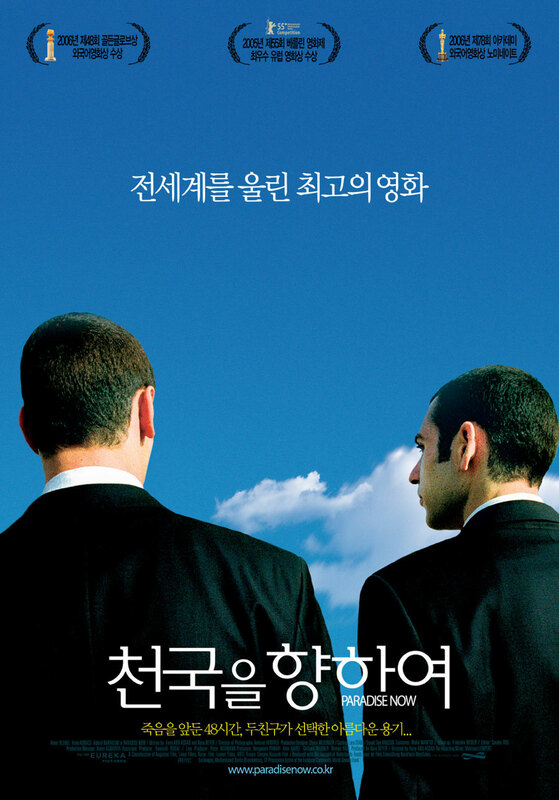 During the 2006 Oscars, the movie’s nationality was hotly debated, with the schizophrenics failing to fully decide between describing it as a film from Palestine, the Palestinian Authorities, or the Palestinian Territories. Though the compromise eventually meant that ‘territories’ was chosen, it caused nothing more than a blip on my radar. A part of the reason is that most films that I have come across or heard of from the regions seemed to deal with the same subject over and over again. Of course, each treatment is different in its own way, but the lack of perceived difference meant that my interest in the film was limited mainly to the controversy, and little else beyond that. Having trawled through Shekhar Kapur’s excellent blog some time ago (he comes off very much as a humanist, more than as a filmmaker. It is a good reminder than there are more important things in life than films), where he fervently and positively showered much praise on the film. "What are we doing tonight?" "Same thing we do every night..."
That wasn’t the case, but nevertheless, I made the effort for it. Though this probably should be noted towards the end of any review, having watched the film I would give a warning to certain people: if you are amongst the religious people who didn’t want to watch ‘The Da Vinci Code’, ‘The Passion of the Christ’, ‘The Message’ or any such movies for fear that it may mislead and turn you away from the righteous path that you so clearly are on, then you may look away now. That’s not to say that it’s an overly religious film; rather, with such a track record, you might be of the mind that it will promote terrorism. What brand of terrorism, though? 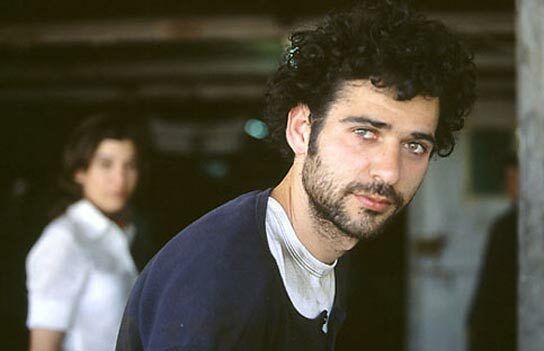 The film follows the story of Said (Kais Nashif) and Khaled (Ali Suliman), two guys who were born and bred in Nablus, Palestine. They are the best of friends, sharing everything together…even the passions and the desire to cause damage to the neighbouring state of Israel. Being a member of a terrorist group (though being relatively inactive thus far), their time has now come: their handlers inform them that the next day, they will be committing a suicide attack against the Jews. Barring a short introduction period, the whole film focuses on their last 24 hours. The Palestinian New Wave is coming up. Omar is jealous of Ahmad's latest accessories. Having prepared meticulously and received their instructions, they both cross into Israel, but are eventually separated, with very different consequences befalling both men. As the story develops, the reasons as to why the characters behave in such a way is slowly revealed, and we are treated to quite a delightful piece of art. And for those who do think otherwise, I really agree with the director on this one. “The film is an artistic point of view of that political issue,” Abu-Assad said. “The politicians want to see it as black and white, good and evil, and art wants to see it as a human thing.” While it tells the story of two potential suicide bombers, it delves in a bit deeper into that. Rather than being a skin-deep, shallow treatment, the director has peeled away the layers and tries to get down to the reasons as to why they believe that this is the only recourse for such situations. Political? Yes, but it doesn’t necessarily demonise or deify a particular group of people. Not unlike Steven Spielberg’s ‘Munich’, in that sense. where both sides of the story are balanced fairly well. This, however, need not be obtained for this film. If anyone is truly serious about getting to the root of the issue, research could have been done to discover the reasons. The film is not really priceless for the political aspects. Rather, as I have mentioned, it is the surreal things that really grabbed my attention. In addition to the video camera scene, you can also buy or rent the tapes that the bombers recorded at a local video store. Even far more interesting is the stripping away of all the demonising portrayed by the media about suicide bombers. Far from being maniacs, both Said and Khaled are well-balanced, intelligent young men, whose love for their friends, family is clear. We could easily have used the sentence above to describe any number of our own friends and family members (perhaps even ourselves). 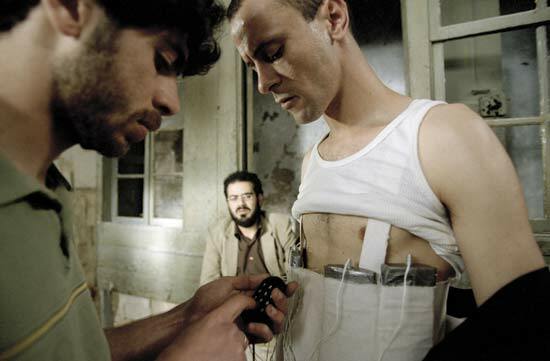 One could argue that the film doesn’t necessarily strip away the stereotypical conventions commonly associated with suicide bombers; rather, it attempts to portray a realistic slice of real life. The passer-by didn't realise that the camera was rolling. The tension of half the film reflects this. After all, no matter what they believe or how strongly they hold on to that belief, no one really wants to die in such a way. The acting portrays the fear and the doubts that each of the men face. Without the acting, this film would’ve been nothing, and both Kais Nashif and Ali Suliman were so fantastically…fantastic. I feel the fear they feel, their heartbeats as they cross the border, and their doubt as the moment of truth nears. I have not felt that for a while. It is funny, in a very black way at times, but such moments are engulfed by the tension that envelops the film, and engrossed me tremendously. Making such a film, then, is not easy. The production had plenty of troubles, including cases of kidnapping and even proximity attacks. The director even publicly stated that he wouldn’t have made it again, given the chance. “It’s not worth endangering your life for a movie.” It probably isn’t, but I for one am glad that he did. If only for showing how little the difference there is between ‘us’ and ‘them’, perhaps those paying attention can start something that will change things. And the world would be a better place for it.